We decided that to cap off our stay in Chamonix, we should probably climb the tallest mountain around … we'd met plenty of tourists who had come to the area for that purpose only, ignoring all the other lovely peaks and interesting routes to focus solely on getting to the top of Blanc. Whilst we didn't envy them their short stay in one of the most beautiful parts of the world, we knew that friends and family might not understand that we had climbed things that, for us, were more fun, more challenging and with just as stunning views from the top and yet had missed the one that everyone comes here to climb. So, to Mont Blanc we were to go! But the truth of the matter was: we just didn't want to join the crowds in a long, slow tramp, taking the easiest line, for the sole purpose of being able to say we'd reached the summit – and yet, on a tall peak like this, we also didn't want to bite off more than we can chew and not make the summit at all. So – which of the many routes to the top were we to take? The routes on the Italian side appealed most of all, particularly as such a route would involve a traverse across the massive, from one side to the other. A quick phone call to the Gonella Hut confirmed our fears that the easiest route to do this was no longer possible, as crevasses had cut open the glacier, but it would be possible to take a different glacier or a rock ridge … perhaps a slightly harder undertaking, but not too hard, and that suited us perfectly. It should be said here that yes, there is a bus – and no, the bus is not expensive or inconvenient. But hitching (around the Chamonix valley, at least) is fast, efficient and certainly cost effective – so we didn't think that hitching through the Mont Blanc tunnel would be any different. After 30 minutes of waiting by the road, we felt less optimistic … and we had to persevere for another 30 minutes before a kind Swiss lady took pity on us and gave us a ride. In fairness to our original optimism, she was shocked it had taken an hour to get a lift. Maybe it was just us? Arriving in Courmayeur late in the evening, we set about finding some pizza for dinner and wondering why they put a dinosaur in their centre square. Not seeing much that inspired us to stick around (ie not finding a hotel within our budget), at 8:50pm we jumped on the last bus to Val Veni with thoughts of finding somewhere to bivouac on the route to the Gonella Hut. A short way up the approach road, we found a flat, soft-ish spot under a large pine tree, laid down the rope, put all our clothes on and got into our bivvy bags … and shortly afterwards, surprised at being warm and comfortable without sleeping bags or tent, we were both asleep. Rising early and not in the most positive of moods, we got moving in order to warm up. 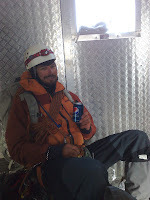 Within a short while, the sun had risen enough to hit the path, making our excess clothes redundant, and our breakfast of a can of coke and cold pizza (delicious!) went down very well. Awake and smiling at 1am. But the thing is, hitting the sack at 9 and rising at midnight meant another night of short sleep! Gulping down the coffee and biscuits, we didn't know if we were eager to climb this mountain or more inspired to go back to that warm bunk, but we knew that once we were on our way it wouldn't feel so bad. Or rather, we hoped it wouldn't! Too easy, eh? Well, keep in mind it was before 1am when we set off and there was no moon that night – just the stars and our headtorches to show the way – but Mark's route finding ability and this description proved to be enough to set us (mostly, we think) on the right course. The difficulties we had were inherent in the path itself, not finding it! First of all, cutting directly left and up onto the ridge itself involved moving over steep and loose terrain – small stones rolled beneath our feet and convenient hand-holds proved to have no foundation. It was slow and careful to progress, particularly as we were not the only party on the route but were the first – right behind us, there were seven more Alpinists, and none of them wanted to get hit by a falling rock any more than we wanted to drop one. 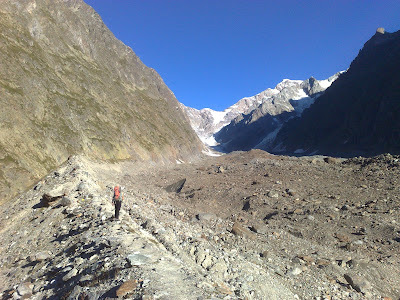 However, we found the entrance onto the glacier easily and started the traverse – and sure enough, found the hard ice and dirt mix too. This was like walking on sloping, slippery concrete and our crampons barely seemed to make any impression at all: the hut warden was certainly right when he said it was the most dangerous part of the climb! The crowd (for all 9 of us were all moving at a very similar speed) dropped vertically down at this stage about 100m and eager to avoid this horrible surface, we followed suit – and this is where, perhaps, we dropped too far and left the hut warden's path. At first, this way seemed easier to gain the middle of the glacier – we dropped down and around to the right of a small-ish crevasse, then followed it across. But to start climbing up again, we needed to weave our way through a series of large icefalls … these are spectacular to see, from a distance, as the ice creates dramatic blocks, curves and deep abysses. Trying to climb through them is a matter of trial and error, as feasible options end in impassable cliffs or drops; as it's also the most active part of the glacier, it's not really the safest place to hang out for too long. Thankfully for us, two keen Spanish climbers had overtaken us on the down-climb and had picked a good route through the ice-fall – it was much faster for us to be able to follow them and avoid the dead-ends. Sunrise and a mouthful of chocolate! It was quite a relief to see the smooth glacier rising ahead of us. Picking up the pace, we started to quickly gain more altitude with our sights on the col, just visible in the starlight on the horizon. 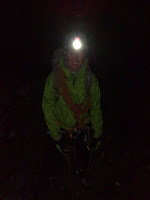 We did have to pass a few more crevasses, working around them to the left, but the way was now much easier. 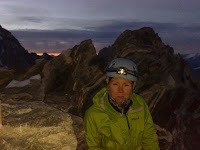 We got to the col at very first suggestion of the sun rising, and realised that climbing from the Italian side had protected us from a strong and cold wind. Time for something to eat, and for some more clothes to be put on! Barely 15 minutes later, as we approached the ridge itself, we had to stop again to put more clothes on … it was cold! The ridge was only footprints wide, but as the sky turned pink and stars were replaced with sunlight, we could see Mont Blanc ahead of us and the peaks and cliffs of the massive, plus the villages and green hills in the valleys spread out below. It was simply stunning. ... and even more up! Over Gouter and up the Bosses ridge, and up some more. 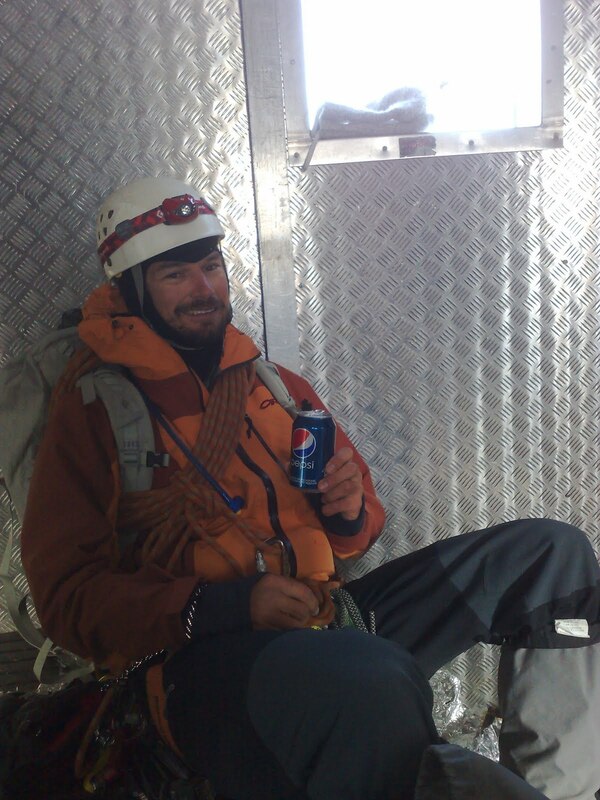 A well-deserved can of Pepsi. We'd covered about half the vertical distance by the time we'd reached the ridge, and all of the more difficult terrain, but there was still another 800m or so of vertical ascent to go. 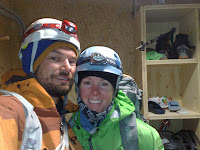 We rested briefly out of the wind at the emergency shelter, but by keeping a steady pace we were on the summit within 10 hours of leaving the hut. They say that the summit is only the first half of the journey, but thankfully I'm more than half way through this blog post! We had chosen to go down via the Aiguilles du Midi chair, following the well-marked path through the snow around Mont Maudit and Mont Tacul. Despite a few dramas at the double abseil point (we managed to reach it at peak hour), and also with altitude and tiredness slowing us down, we made it back up the steep slope to the Midi in more than enough time for the last chair back down to Chamonix … where Fred, a hot shower and a good night's sleep were waiting.